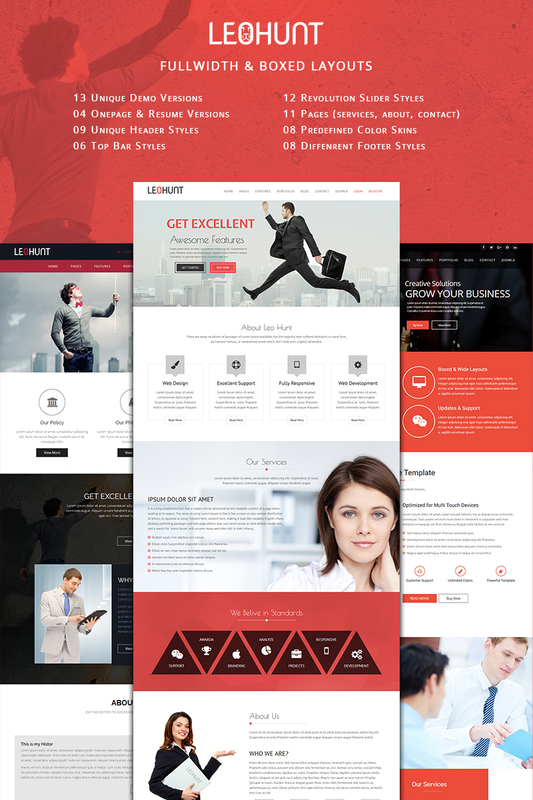 LeoHunt is a responsive Multi-Purpose Joomla Template. (Desktop, tablet and mobiles) simple, clean and Professional theme. It comes with 13+ Home Page Veriosn, 4+ One Page Versions, Full width and Boxed Themes, 08 Predefined Colors, 12 Awesome Slideshows Styles, 14+ custom pages (About Us, Services, Careers, FAQ). Easy-to-customize and fully featured design. This theme Created for all business such as Corporate, Business, Portfolio, Creative, Landing pages, Blog and many moreâ€¦ In the demo use the Theme Options Panel to see everything you can do with this template.